The EPIC campground is located on the North East side of the precinct. 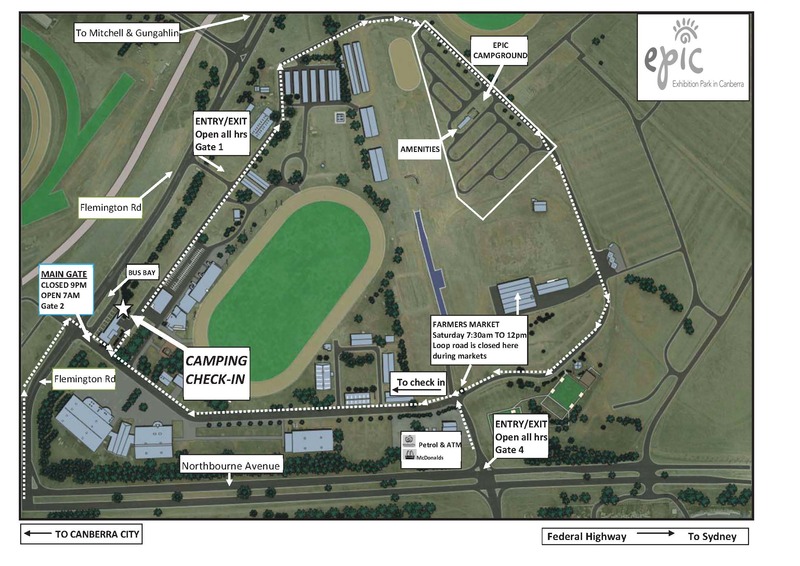 Campers can enter through Gates 1 or 2 (main entrance) off Flemington Road, or Gate 4 off Federal Highway and drive around to the campground via the internal ring road. Campers are required to check-in on arrival at the Camping Administration Office, which is located at the main entrance (Gate 2). If you are arriving outside of office hours, maps and directions are available for collection from the office. Download the directions to Exhibition Park In Canberra Campground PDF. For further information please phone (02) 6205 5230 or to email click here.